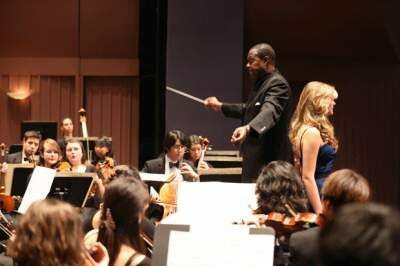 Five years ago the UCI Symphony Orchestra, led by Maestro Stephen Tucker, adopted the Santa Ana High School (SAHS) Symphony Orchestra. The partnership was designed to build awareness of the university experience to make it a tangible goal for the SAHS students; increase access to arts resources; and cultivate engaged young artists, the Trevor School students, who will become involved citizens in their communities not just in the arts. For the first time, the UCI Symphony Orchestra will perform a full concert in Santa Ana, continuing the intersection of our two communities for the benefit of both, on Nov. 4, 2016 at 8 p.m. Experience the famous Bill Medley Auditorium, whose namesake is the Grammy Award-winning singer and songwriter best known as one-half of The Righteous Brothers and a SAHS alumnus ‘58, to support both schools at this special concert.